iPad Kids is just getting geared up, and we’ve already unearthed some real gems. Here are the 10 best apps of 2012 that we’ve reviewed so far. Definitely check them out – each one is a guaranteed winner. Have other favorites? Let us know via Twitter or Facebook, or leave an old fashioned comment below. Scribblenauts remix is a delight. You help the main character, Maxwell, creatively solve problems by spawning tools for him to use. This is one of the most fun games we’ve come across on the iPad, for all age groups (including adults). It is wildly entertaining and stretches your mind and imagination in ways that aren’t even touched by the competition. This is by far the most open sandbox style app on the market. Check out our full Scribblenauts Remix review, it will be a wild ride! Walt Disney’s “Where’s My Water?” is an expansive physics-based puzzle game with vivid animation and entertaining gameplay that is quite addicting. It spawned an entire line of apps, and has become a poster child for a successful thinking-man’s app. It is definitely worth checking out, but make sure you have your thinking cap on. Check out our full Where’s My Water? review and give Swampy the alligator a bath! Toca Kitchen is a fun and quirky app that allows the player to be a virtual chef, feeding four wildly different diners. With no pressure or points, and complex feedback, this is the perfect app for the tot who always wants to help out at dinner, but whose desire to mix strange ingredients with even stranger ingredients leaves a lot to be desired. Check out our full Toca Kitchen review and get cooking! Bugs and Buttons is an engaging romp through a digital backyard. With 18 fantastic, interactive games, there’s something for every mood and energy level. This is truly one of the must-buy apps for our youngest folks using the iPad, because of its educational nature and the amount of movement it encourages. You can’t go wrong with this one. Check out our full Bugs and Buttons review and start bugging out! Tiny Wings HD only requires one finger to play, yet it manages to be at turns thrilling and calming… and it’s always addictive. In it, you use strategic poking to launch a bird off sloped hills and across a gorgeous landscape in a race to beat your winged siblings. With gentle music and fun sound effects, it can be oddly competitive and has a wildly innovative two person mode. Launch yourself at this app, and check out our full Tiny Wings HD review! Bugs and Bubbles is the much anticipated sequel to the bestselling Bugs and Buttons (another app on our liste), and it does not disappoint. This is one a true must-have app of the year! 20 different games that are all intuitive and fun, make this engaging app slightly more in-depth than its older sibling. Keep in mind this app targets a slightly older audience as well. For more details, including a list of all the games with descriptions, check out our full Bugs and Bubbles review. Disney’s companion app to their upcoming animated feature release in November is full of retro kitcsh and old-fashioned arcade fun. This one caught us by surprise because not all movie tie-ins are concerned with quality (they tend to concentrate on promotion). We must say, Disney does have a good track record of taking a step up with their apps, even one that takes a step back in time. 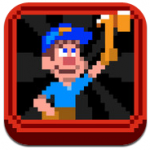 Get the full deal with our full Fix-it Felix, Jr. review. Disney just won’t give up! Mickey Mouse and the gang take to the streets in this interactive game from the House of Mouse lineup. This app gets an extra boost for being a truly engaging tie in with their television programming. This game is based on an actual episode of the animated TV series “Mickey Mouse Clubhouse,” but being familiar with the show is not required for a fun time. 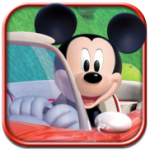 Learn more with our full Mickey Mouse Clubhouse Road Rally review. 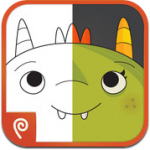 Get those monsters out from under the bed and move them to the iPad with this fun and quirky coloring book app! With wacky characters, an intuitive setup, and a versatile interface, this coloring book app is the perfect companion for you and your child to have some together time, or for some solo coloring time. There’s no better way to bring crafting on the go! Check out our full Monster Coloring Book review. Whoa, Nana! No need to go over the river and through the woods to enjoy this educational app for the youngest of the iPad users in your family. A visit to Grandma’s house will give your kids a green thumb. Grandma’s Garden was a sleeper hit that definitely caught us off guard. The bright graphics and straightforward instructions soon won us over. 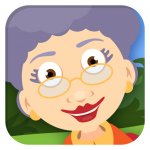 Learn more by reading our full Grandma’s Garden review. I will check some of these out! My daughter’s favorite app of the moment is “Punky Dunk Project,” an old book that’s been updated for today’s kids. Lots of little hidden things to play with, read in English and Spanish. Thanks for the recommendations. Theresa, we were just looking for some new books to review and that one sounds like a great one – thanks for the recommendation! I have three of these, and they’re good! I also recommend THE PUNKY DUNK PROJECT, my twins have a good time with that one. Thank you Jillian, we’ll be sure to check that out!